Hello everyone and welcome to another sunny Monday, (well it is in my neck of the global woods anyway) : ). Just to let you know that I’ll be posting twice this week, as I’ve a small back log of posts that I promised to release, so look out for something else on Wednesday too. A couple of weeks ago I received an email from Lily Irwin who has been a reader of my blog for quite a while. I discovered that she was an illustrator and that I really liked her work, so I invited her to answer a few questions and display her work for everyone else to enjoy. Loose yourself in these illustrative escapes. What are your first memories of drawing and at what age? How long have you been an artist? The most vivid memories of early childhood rest heavier on the imaginative worlds I created, most of the time brought to life alongside my Grandmother who possessed an extraordinary and rich imagination – old brass beds were turned into boats on perilous seas and banquets were held on old tree stumps in the garden surrounded by our many animals. I mostly drew onto walls as a young child, much to the despair of various family members. However, one of my first significant memories of drawing was my lessons with Lesley Fennell, a great friend and painter who lives down the road from us in Ireland. I must have been four or five when I first went to her studio. 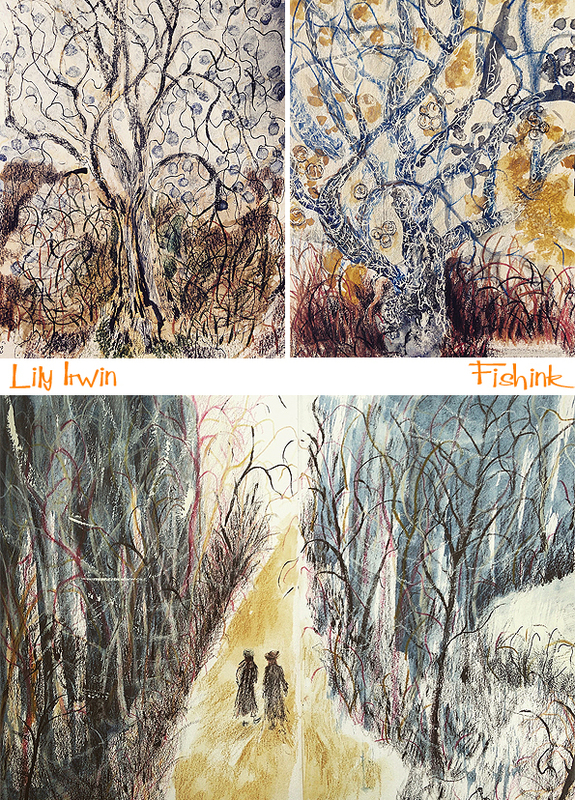 Observational drawing was paramount to Lesley’s teaching – whether we were creating and building layers of collage or drawing birds and plants in the woods. I loved to write and illustrate stories as a child. One imaginary story that played a continuous role in my early life was a strange coming of age tale which involved rabbits, not a particularly happy world from what I remember, as the rabbits bade farewell to childhood, their ears would begin to droop and they were forced to wear clothes which seemed a preposterous idea to them. I lost drawing in the midst of adolescence, like many others, it was a difficult time for me, lots of things that had been precious to me as child, disappeared under the surface. However, it began to come back to life in the last years of university, it started quite naturally, I remember I was reading Carrington’s illustrated letters at the time which sparked something in me. The drawings were mostly on scraps of paper, all pen and ink, very fine and detailed. I have gradually broken away from that, experimenting with many different materials. Studying at Cambridge has brought many wonderful things, but most significantly it has reignited my love of drawing from life. Your artwork is very textural and detailed, what mediums do you most like to use and why? 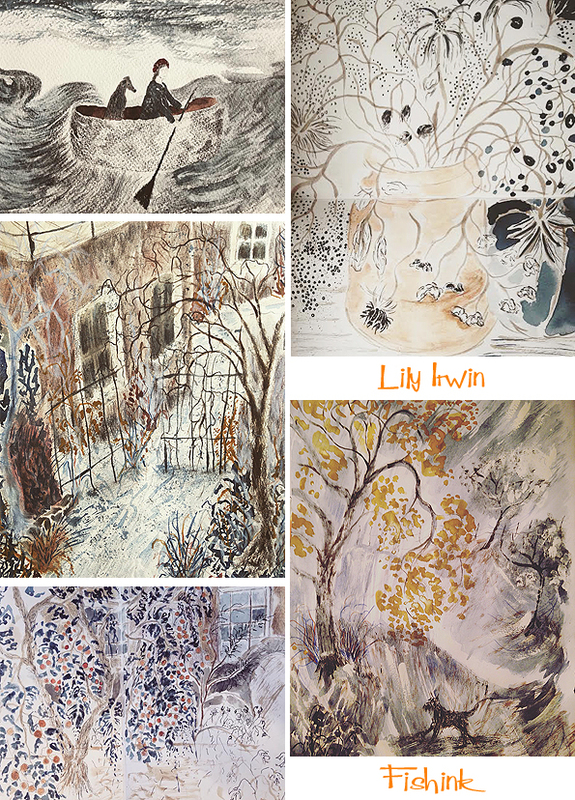 I love to experiment and explore – my drawings are like great stock pots, filled with all kinds of different materials. 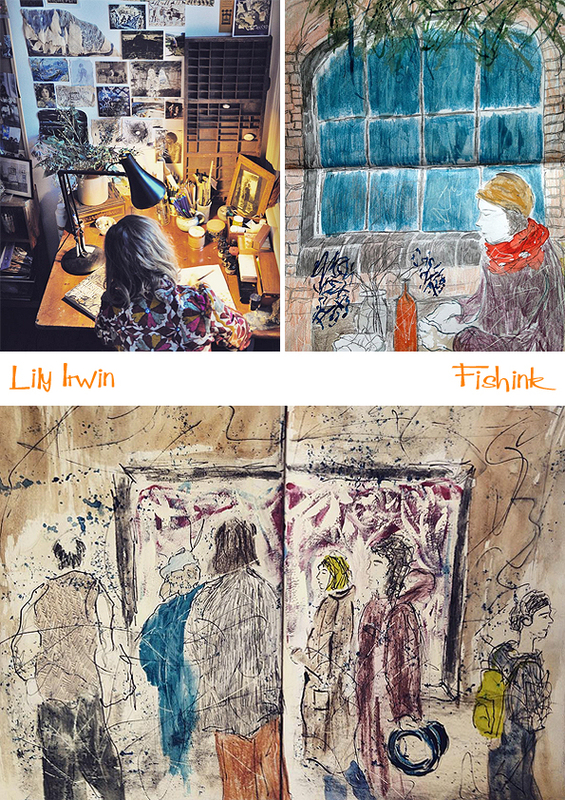 Those that emerge most in my drawing are gouache, dip pen, pencil, oil and chalk pastels, lime wash and white ink. Most of my favourite materials are found by winding ways such as lime wash which I discovered lying in the cupboard last year or my favourite pencil – a paper mate extender, an unassuming character, very cheap but brilliant, spotted whilst queuing in the post office one day. They’re of a mysterious grade but create the most beautiful lines and marks. Colouring pencils – both watercolour and oil based – are another constant, I love luminance and derwent, the colours are very rich and blend and battle with their own kind and with other materials too. Collage is another medium which forms a great part of my work, I have bags and boxes filled with recycled paper or old prints which I cut and build up, usually mixing in other materials like ink or gouache. I also like to create my own papers which can come together simply by rolling ink or sometimes using strange materials like fish bones. Do you work mostly from photographs or your memory/ imagination when you work ? 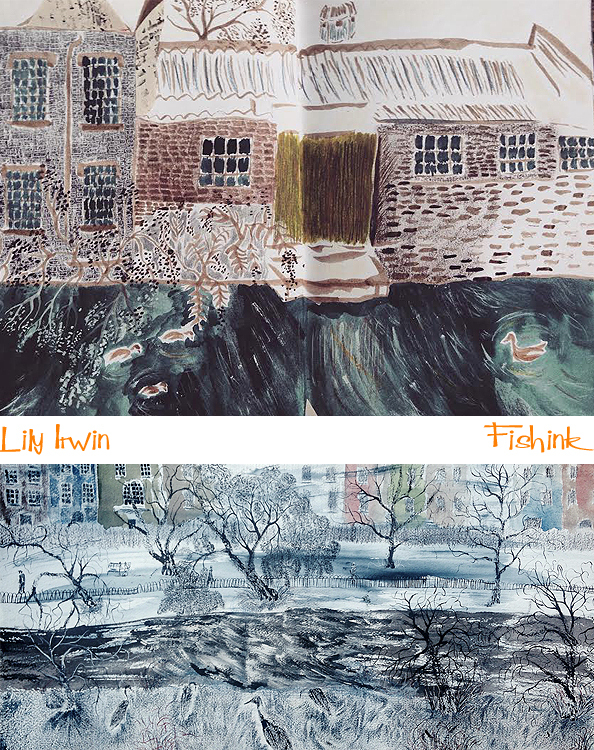 Before my time at Cambridge, I relied mostly on my imagination or photographs – my work was very dense and intricate then, I tended to work only in pen and ink. I think my imagination found itself malnourished by only having photographs as a reference. My first term at Cambridge focused entirely on observational drawing. I found it a great struggle at first but as the weeks unfolded I suddenly sensed this tremendous shift. It was transformative, not only in my drawing but how I perceived the world around me; it felt like I was learning to see again, discovering inspiration in all kinds of unlikely places. Drawing from life brings so much richness to the imagination, I am fascinated by how a drawing unfolds when you are actively engaged and looking at something – there is a mystery or a magic to it. I am also very interested by the idea of working from memory and would like to explore it more – it can be quite frustrating and find that I usually have to rely on my observational drawings as a reference point, in order to bring the memory to life on the page. I see animals, woods and water as familiar themes in your work, is that an accurate depiction of your favourite items to illustrate ? I think all three are very significant to my work. I have always lived by the water and surrounded by trees – our garden and countryside is filled with chestnuts, oaks, apple trees and birch. The house I grew up in Ireland, attached to an old derelict mill which looks onto the river Griese, and in London, we are only a short cycle away from the canal. Water is a very grounding and peaceful presence and I find that I constantly gravitate towards the river or canal to draw. Animals are another constant presence in my life – we have six dogs and a Burmese cat in Ireland. 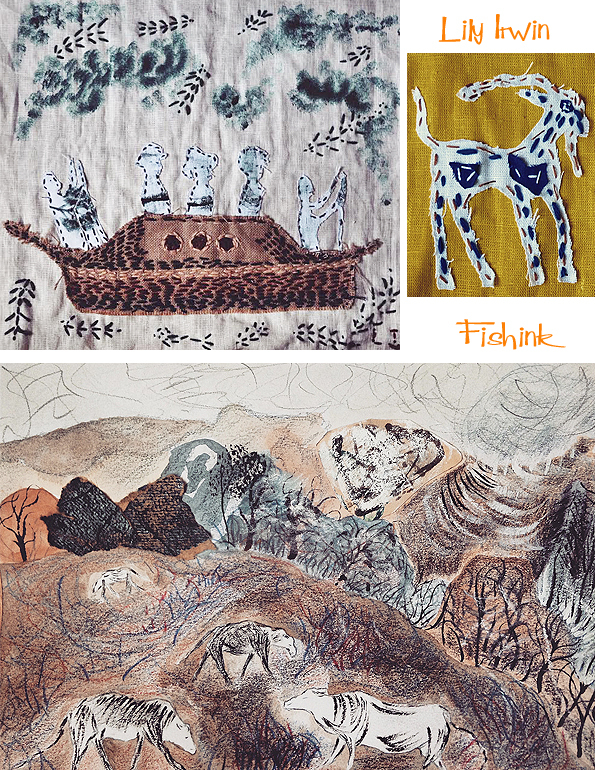 The Burmese, Captain Blue and our lurcher, Pip forever appear in my work, their characters are extraordinary – both possess something magic, Captain is almost like the Cheshire cat, appearing out of doll’s houses and holes in the ceiling. Pip is equally rare, quite a fragile person, far more at ease out in the wilds. Can you explain why you often seem to prefer slightly muted or limited colours in your illustrations ? I have recently tried to experiment with a brighter palette but I seem to have a natural inclination towards deep blues and sepia tones. I can’t explain why muted or limited colours recur in my work, perhaps it is somewhat subconscious – I think using a limited palette can bring coherence to a piece, particularly in my case as I use a great deal of marks and patterns. Whenever I bring too much colour together, I think it can cause the final piece to become fragmented, the marks become lost amongst the chaos of colour. Tell us about your experiences on the MA course at Cambridge. Where do you hope it may lead you? The most profound experience at Cambridge has been the shift towards observational drawing. The course is led by a diverse and wonderful group of artists – during my first term, the artist and print-maker, Charles Shearer taught several of our classes. 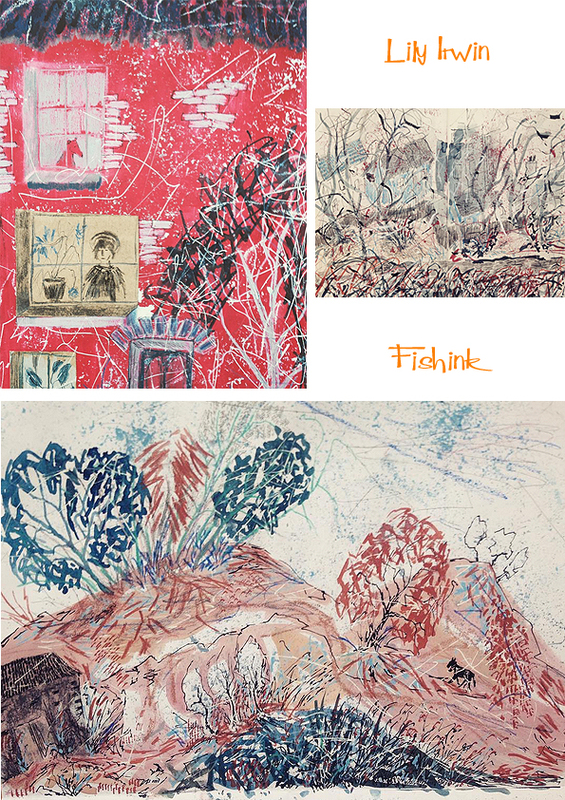 Like many artists, Shearer is openhearted and generous with his work – tables were often filled with his prints and sketchbooks from over the years for us all to see. I was fascinated by his sketchbooks and the many materials he uses and experiments with. One sketchbook was filled with animals observed over one day at the zoo – beautiful gouache washes finished with sensitive lines, capturing the spirit of each animal. Others were of time spent in Romania or Ireland – chalky landscapes, brought together with charcoal and gouache – rich with magic. I have just begun my second term, exploring sequential imagery – I am working on a story inspired by a journey my father once made through the snow with an hysteric parrot and two great danes. At the moment I am wholly immersed in the course; rather like one’s sketchbooks, I am taking this time to explore and experiment without worrying too much about the end result. When I look at your work, I think of Laura Carlin, Lowry and Chagall. Whose work do you most admire as an artist? Laura Carlin has been an enormous influence. I discovered Laura Carlin and Beatrice Alemagna around a similar time, both were the seeds of inspiration to pursue children’s book illustration. They approach illustration like painters – fearlessly experimental and abstract, their work comes purely from the heart, showing great sensitivity and understanding, never consciously writing to a child. Many of my favourite artists fall into the early and mid-Twentieth century – David Jones, Matisse, Mary Fedden, Paul Nash and Dora Carrington. The early romantics, William Blake and Samuel Palmer are also very influential. There are a number of contemporary artists that feed heavily into my work. I love Charlotte Ager’s drawings, an artist on the cusp of graduating from Kingston. I’ve recently discovered the work of two Russian illustrators – Nastya Smirnova and Ekaterina Khlebnikova, their drawings are mysterious and macabre, beautiful textures, I see the spirit of Alemagna in their work. I joined a number of other illustrators for an exhibition earlier this year, ‘Artists as Book Illustrators’ at Potterton Books in London. I will soon be preparing for another exhibition taking place in the late summer at the Grennan Mill in Ireland, my grandmother’s old mill which is now an art school – they will be exhibiting the work of potters, painters, weavers and illustrators to celebrate Kilkenny arts week in August. 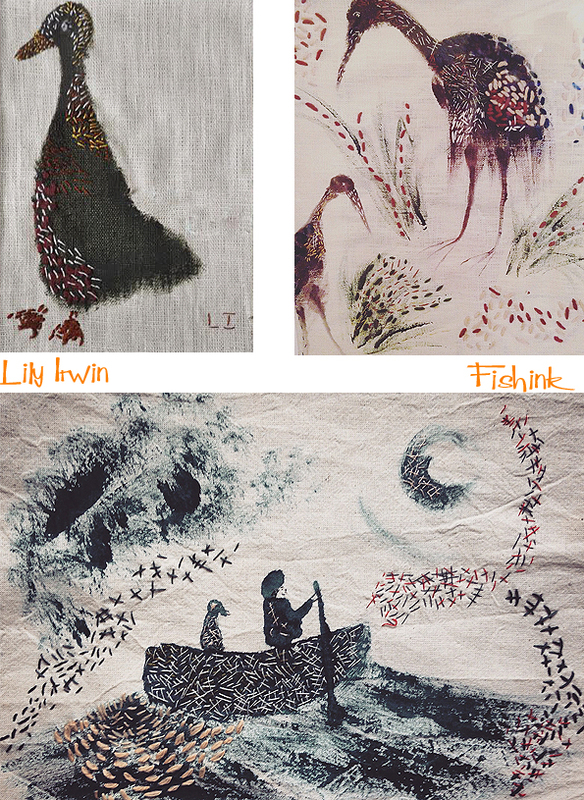 Many thanks Lily for your well considered replies and the use of your beautiful work to give us all a smile today. The best of luck with your illustrative journey and your own road to discovery and experimentation. I will keep my eye on the children’s bookshelves at Waterstones, for your name in the future. Stunning! Speechless with wonderous awe!